Pipe are one of those bands that maybe the rest of the world didn't get around to appreciating as much as I thought they should've, but that's okay. Coming out of the prolific Chapel Hill, NC, scene of the 90's that saw them swapping members with Superchunk and Small 23 (among others), Pipe hammered out a legacy through their coupla handfuls of singles and albums-- including one of the greatest punk rock singles of all time (with a baseball picture sleeve and a Replacements cover on the flip; how can you beat that?) -- that's tough to overlook. On the short list of bands (along with the New Bomb Turks, Kepone, etc) whose songs could be tight and well-crafted and still sound sloppy and punk rock at the same time, Pipe's most memorable attribute seems to be the paint-scraping vocals of Ron Liberti (see also: The Ghost of Rock). It isn't too hard to imagine these guys kicking up a hell of a racket live, something that I never got the chance to check out for myself, unfortunately (though I did get stuck seeing Polvo once, so figure that one out). I lived in Chapel Hill from 93-98 and saw plenty of fantastic local bands. 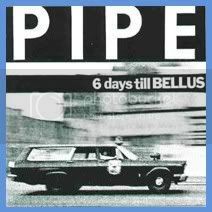 Pipe is my absolute favorite live act of that time period. Pure and utter ROCK. I never got to see them, but they're definitely one of my favorite bands from that era also.